The sciatic nerves down through the buttocks into the back of each leg. Each consists of five smaller nerves extending from your lower spinal column. These nerves then join together and travel down the leg. The sciatic nerves then divide into smaller nerves innervating the knee, foot, toes, calf, and thigh. The inflammation of any one of these nerves is referred to as sciatica. 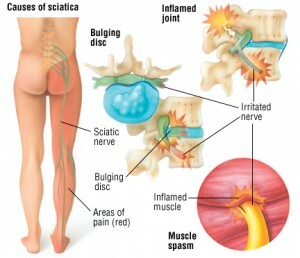 People with sciatica can sometimes experience a “shooting” pain down the back of the leg and into the foot and toes. Others may experience a dull ache or numbness. Sciatica symptoms usually start out as a sharp pain in the lower back. Eventually, that pain radiates down the back of the leg, and typically gets worse when sitting or standing in one position for a long period of time. Sometimes you may feel pain in both legs at the same times, other times it can alternate between legs. The sciatic nerve is very long, and there are many points where irritation can occur. Your lower back is a very common location for sciatic pain. The cause could be a misaligned lumbar vertebra (referred to as a subluxation) or a bulging disc placing pressure on the nerve, which, in turn, causes pain. A bulging disc, as mentioned before, or disc herniation can also be the cause of your sciatica. If you’ve been injured in a vehicular accident, from a fall, or are just susceptible to degenerative disc disease. one or more of your lumbar discs may be bulging out an placing pressure on your spinal cord or nerve roots. This is also informally referred to as a slipped disc. Medical doctors will normally treat this condition conventional pain killers, tell the patient that the condition may eventually go away on its own. This seldom happens, and the net result of constantly taking these medications is that the patient’s liver, kidney, or stomach lining can be damaged by the long-term use of typical over-the-counter pain medications. It is far better to treat the underlying condition rather than to simply mask its symptoms with drugs. Here at our Gaithersburg/Rockville Chiropractic Clinic, Dr. Davis has the expertise to evaluate, diagnose, and treat your sciatica symptoms. Call us today!